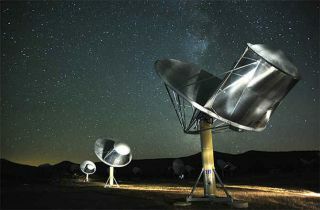 The SETI Institute used its Alien Telescope Array in California to confirm an intriguing radio signal coming from the star HD 164595, located about 94 light-years from Earth. Humans will make contact with aliens by the end of the century, theoretical physicist and futurist Michio Kaku told Redditers last week. However, Kaku said he wasn't sure whether we'd be able to communicate directly with this unknown extraterrestrial society — one that could run the gamut from hostile to pacifist, according to Kaku. In his AMA on Reddit, Kaku responded to a question about alien civilizations, saying, "Let me stick my neck out. I personally feel that within this century, we will make contact with an alien civilization, by listening in on their radio communications. But talking to them will be difficult, since they could be tens of light years away. So, in the meantime, we must decipher their language to understand their level of technology. Are they Type I, II, or III??? [These represent three categories in the Kardashev scale, measuring technological achievement in civilizations based on their level of energy use for communication.] And what are their intentions. Are they expansive and aggressive, or peaceful." Futurists and theoretical physicists, among others, have proposed a range of ideas for when and how Earthlings could "hear from" E.T., with one astronomer's calculation predicting it would happen within 1,500 years and another suggesting we'll find intelligent alien life by 2040. Though a recent survey suggests humans would be cool with alien interlopers, many scientists and thinkers have warned about the risks involved. Famed physicist Stephen Hawking has voiced his concern several times, saying that intelligent aliens would have no problem wiping out the human race. That said, the same futurists and theoretical minds also fear that the same fate could be dished out to us by human-created artificial intelligence. When Kaku mentions humanity's eavesdropping on extraterrestrial "radio communications," he is likely referring to what alien hunters call narrow-band signals, or those that are spread over only a very small part of the radio extent of the electromagnetic spectrum — no more than a few hertz wide. By comparison, noise emanating from galaxies, quasars, pulsars and other cosmic entities typically extends across a wide swath of the spectrum. Narrow-band noise could therefore be "the mark of a purposely built transistor," according to the SETI Institute. "Alien life" can refer to anything from little green men to microbes. But when Kaku refers to extraterrestrial life that is capable of communication that traverses light-years, he is clearly talking about more advanced beings. As a civilization grows and becomes more sophisticated, it will inevitably use more energy. As a way of measuring how advanced a society is, Russian astrophysicist Nikolai S. Kardashev in 1964 proposed using this energy as a proxy. The Kardashev scale moves from Type I, a civilization that can harness all the energy of its home planet (Earth is just about at this level); to Type II, which can use all the energy from its parent star (a Dyson sphere is the most common example), to Type III, a civilization that can control all the energy from its home galaxy. Narrow-band signals "pack a lot of energy into a small amount of spectral space, and consequently are the easiest type of signal to find for any given power level. If E.T. intentionally sends us a signal, those signals may well have at least one narrow-band component to get our attention," according to the SETI Institute. In his new book "The Future of Humanity" (Doubleday, 2018), Kaku paints a picture of what these aliens might be like, based on interviews with experts in exobiology. They'd have three traits: stereovision (needed to hunt prey), grasping appendages like opposable thumbs, and their own language, according to news reports. If these "little green men" with opposable thumbs make contact, what happens next? That would depend on the beings' level of intelligence, experts have said.